Your home or business will look fresh and new again with interior and exterior painting services from Thinking Global Painting Co. With highly experienced master painters on staff, we have the ability to accomplish the unique vision you have for your home or business at an affordable cost. Enhance the beauty of your Eugene-Springfield area home or business with our pressure washing, restoration, and remodeling services. We also offer drywall repair, refinishing, and trim replacement that will have your home or building looking brand new again! Contact us today to request a bid for painting services from Thinking Global Painting Co. We have proudly served the Eugene-Springfield area since 2008 and look forward to working with you whenever you need a reliable painting contractor. We love what we do, and we can give your home or office building a beautiful fresh new look with the comprehensive interior painting and exterior painting services that we offer at Thinking Global Painting Co. Our team of professional painters treat every job with the respect it deserves no matter what size or scope of the project. Serving the Eugene-Springfield community since 2008, our company owner has been European Master trained in the painting trade, and his father was a master painter. We are now offering a full 10-year warranty on all of our exterior painting (most companies only offer five-year warranties). The reason our warranty stands out from the rest is that we use higher-quality long-lasting paint and apply it with care and according to manufacturer specifications. Company owner, Robert, is the bidding agent for Thinking Global Painting Co, and he works on the jobs right along with his employees. When you see him in action, you'll see immediately that he loves his job, and has fun painting and overseeing the work at different sites each day. He also enjoys helping clients with one of the toughest decisions of all when it comes to painting -- choosing just the right paint colors for the interiors and exteriors of their home or office that they will enjoy and love for years to come. With a combined 70 years of experience, the majority of our painters have at least five years of experience, and many have more than ten. Additionally, a number of our technicians have worked for the Painting Union and bring years of skill and experience to every project. 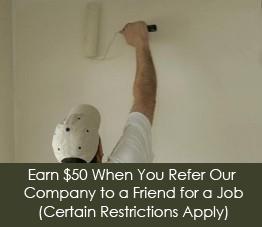 When we show up at your door, you can count on professional, certified journeymen painters who follow painting guidelines, regulations, and legal requirements. But most of all, they will make you glad you chose Thinking Global Painting Co as your painting contractor. Restore the beauty of your home or office today with a professional paint job from Thinking Global Painting Co.